Combined Category D, C, B tested protector (to BS EN 61643-21) suitable to protect telephony equipment plugged into a BT telephone (BS 6312), Modem (RJ11) or ISDN (RJ45) socket. 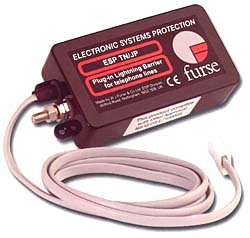 For use at boundaries up to LPZ 0B to protect against flashover (typically the service entrance location) through to LPZ 3 to protect sensitive electronic equipment. Connect in series with the telephone or ISDN line. These units are usually installed close to the equipment being protected and within a short distance of a good electrical earth.